Double taxation has been dubbed “one of the most visible obstacles to cross-border investment,” leaving room for a significant amount of money to be saved under the over 3,000 double taxation avoidance agreements (DTAs or DTAAs) signed between nations across the globe. To combat such obstacles, DTAAs aim to prevent the same income from being taxed by two or more states, while also eliminating tax evasion and encouraging cross-border trade efficiency. DTAAs are mostly of a bilateral nature, and while DTAA-signing countries are not all members of the Organisation for Economic Cooperation and Development (OECD), DTAAs are generally based on model conventions developed by the OECD or (less commonly) the United Nations. And while about 75 percent of the actual words of any given DTAA are identical with the words of any other DTAA, the applicability and specific provisions of each treaty can vary substantially. 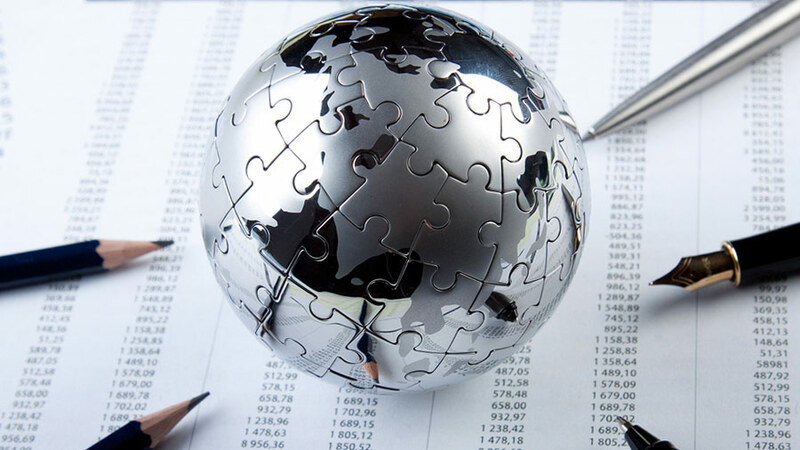 From an investor’s perspective, confusion about international taxation can arise when investors are subject to two different and potentially conflicting tax systems. For example, Hong Kong and Singapore adopt a “territorial source” principle of taxation, which means that only profits sourced locally are taxable. 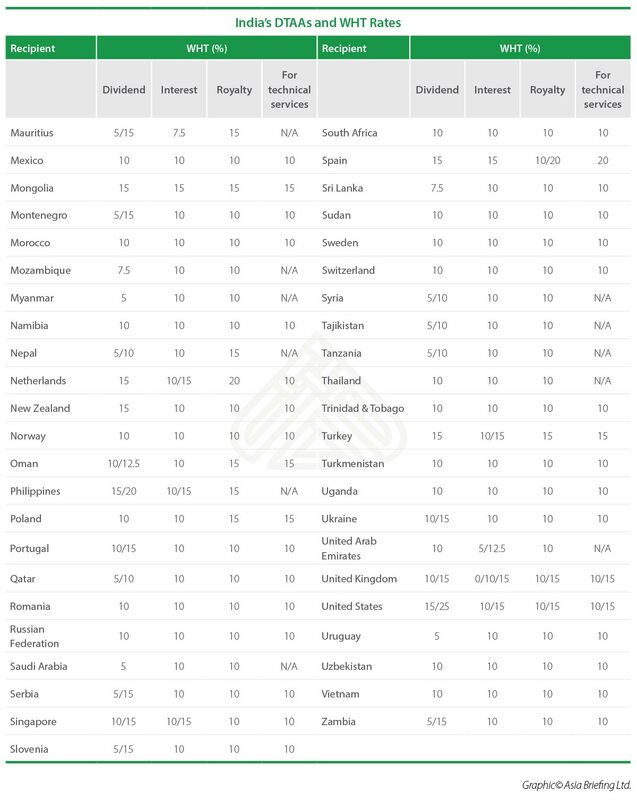 Meanwhile, other countries, such as India and the United States are on the worldwide tax system, and resident enterprises can be required to pay tax on income sourced both inside and outside of the country. DTAAs not only provide certainty to investors regarding their potential tax liabilities, but also act as a tool to create tax efficient international investments. DTAAs apply to individuals and companies of the countries or jurisdictions who are parties to the agreement, with the aim to prevent double taxation by allowing the tax paid in one of the two countries to be offset against the taxes payable in the other country, and/or by providing exemptions or reduced tax rates for specific income types, such as royalties, interest, and dividends. DTAAs also affect the repatriation of profits and earnings, as the location of profit taking and distribution can be manipulated favorably under the correct circumstances. This means that profits may be permitted to be taken in a lower cost jurisdiction than would normally be the case and distributed from there back to the overseas headquarters. This makes complete sense when developing a business in Asia, as capital injections and investments can then be made from the lower tax jurisdiction. The distribution of dividends back to the home domicile can also be arranged in a beneficial and less tax burdensome manner than would otherwise be possible. Many preferred holding company jurisdictions maintain DTAAs that limit or eliminate the level of withholding taxes payable on dividends coming from subsidiary countries and going to parent companies. For example, Singapore has a DTAA in place with India that lowers dividend distribution (withholding) taxes from the general rate of 15 percent in India for foreign companies to 10 percent (provided certain capital holding requirements are met). 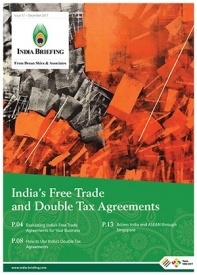 What this means for foreign businesses is that they have the option to create a corporate structure so that profits from an India subsidiary may be remitted to a Singaporean holding company at a 10 percent withholding tax rate on dividends, before then being passed on to the overseas parent company with no additional tax obligations. 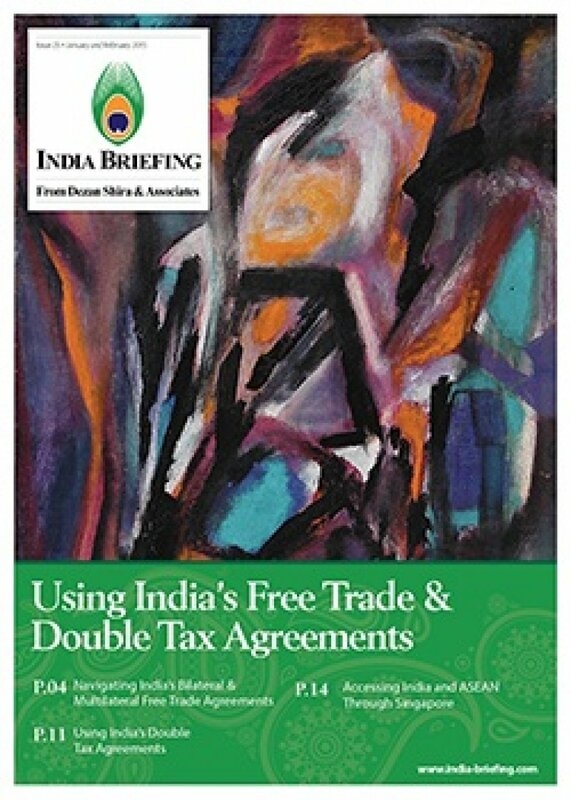 In contrast, if the India subsidiary were to remit directly to the parent company in a country that does not hold a DTAA with India, it may be taxed at a withholding tax rate of 15 percent. Such reductions can represent significant tax savings over a period of time, being realized instead as additional profits. DTAAs also exist to define areas where companies may not be considered to be generating taxable income in one or the other country. Within these, a key area is the concept of permanent establishment (PE) status. Triggering PE status is an issue of great importance as it defines the taxable status of particular legal structures and trade. A typical DTAA, for example, contains clauses related to the PE concept and this can favorably impact on the total investment needed to enter the target market. It can also impact upon the type of legal vehicle actually required to be incorporated and, in some cases, does away with the need for one altogether. The concept of PE is primarily used to determine a specific state’s right to impose tax on the business activities of foreign companies operating in that country. Where a resident of a country carries on business in another country with which the resident’s country has a DTAA, the profits derived will not be subject to tax in the other country unless the business is carried on through a PE. Once an enterprise triggers PE status in a country, that enterprise will be subject to the host country’s relevant business taxes, and any qualifying staff will be subject to individual income tax in the country as well. As such, it is critical for foreign businesses operating within Asia in any capacity to stay on top of their PE applicability and the relevant tax rates in the region. 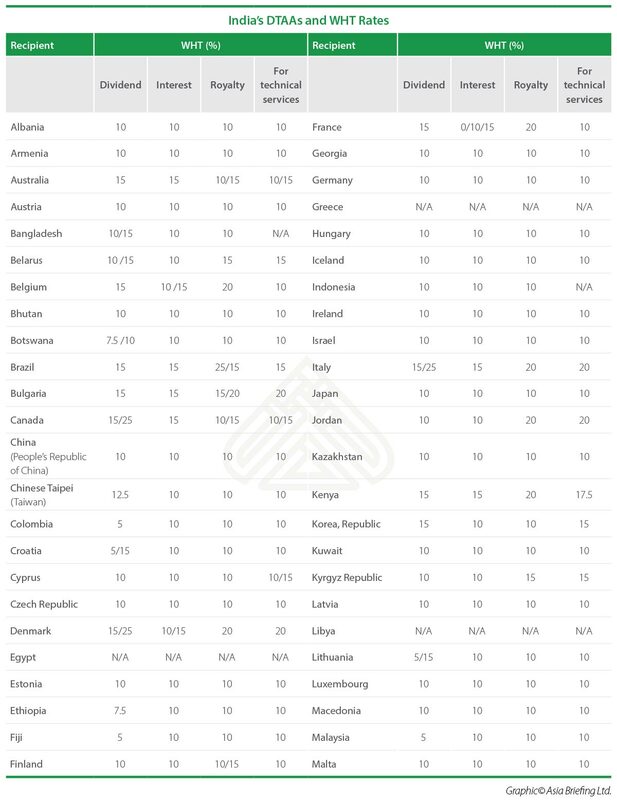 With further regards to PE qualifications, the OECD Model Income Tax Treaty defines a PE as a “fixed place of business through which the business of an enterprise is wholly or partly carried on.” However, while most DTAAs do use the OECD definition, countries are allowed to define what constitutes a PE independently. This can have highly beneficial results. For example, a well-structured incorporation can carry out effective services for its parent company – in some cases to the extent of billing local companies on their behalf – without triggering tax exposure in the secondary country. It depends upon how the PE issue is addressed within the specific DTAA. Selecting a favorable holding company channel for investing in India is a challenge, as it requires taking into account the tax treaty network along with Indian domestic tax law. 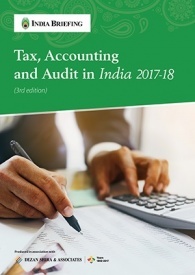 India levies a dividend distribution tax (DDT) on the Indian company that distributes the dividends; DDT is an additional tax payable by the dividend-paying company, which is over-and-above the income tax, with the benefit of the same being unable to be reduced while paying income taxes in India. India’s network of tax treaties play a critical role in tax efficient structuring of cross-border transactions into India. Tax treaties generally follow the policy of having an emphasis on source-country taxation of interest, dividends and capital gains from the alienation of shares. Deviations and specific provisions in some of the tax treaties offer a number of opportunities for tax planning. Mauritius has been a popular jurisdiction for establishing a holding company to route FDI into India, along with Cyprus and Singapore. India’s beneficial tax arrangement with these countries led to them becoming the top sources for foreign direct investment (FDI) into India. It is this outcome that ultimately motivated the Indian government’s plans to revamp its respective tax treaties with them. On December 30, 2016, Singapore and India agreed on amending their DTAA for capital gain income. With the new agreement in effect since April 1, 2017, India aims to tackle investments coming into the country through shell companies and prevent tax avoidance. This follows the agreements reached by India and Mauritius in May 2016 and India and Cyprus in November that year, when they similarly amended their respective DTAAs by implementing a Limitation of Benefits (LOB) clause. 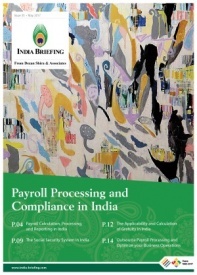 Meanwhile, India has gradually adopted OECD standards to regulate residency and transfer pricing norms, and became a signatory to the OECD’s Multilateral Competent Authority agreement for the automatic exchange of Country-by-Country reports (CbC MCAA) in 2016. Place of Effective Management (POEM) regulations in India came into effect on April 1, 2017; POEM is an internationally recognized test for determining the residence of a company incorporated in a foreign jurisdiction. The new norms will apply to the assessment year 2017-2018 and subsequent assessment years. There will be no retrospective assessment. The General Anti-Avoidance Rules (GAAR) came into effect in India from April 1, 2017; GAAR is an anti-avoidance regulation that allows tax authorities to deny tax benefits on transactions conducted with the purpose of avoiding taxes. Both POEM and GAAR tackle the perceived weaknesses in international tax rules, addressed in the OECD Country-by-Country Reporting Agreement’s Base Erosion and Profit Shifting (BEPS) measures. In addition to the above mentioned taxation implications, DTAAs lay out the ground rules for many other bilateral tax agreements. The nature of these differ significantly depending upon each individual treaty; however, each should be studied in detail to ascertain both the required legal structure and the scope of trade. International businesses intending to trade with India and/or establish a physical presence would be wise to examine the applicable treaties and seek professional advice over the legal and financial implications prior to contemplating the legal structure itself.